Pitchblack, Tuner/Pitch Pipe/Tuning Fork from Korg in the Pitchblack Tuners series. Eroachguitar's review"A sturdy, accurate, yet slow and dim tuner." Korg has been in the tuner game for over 20 years, being famed for the accuracy and quality of their rackmount tuners. Korg introduced the Pitchblack series of tuners in 2008, to much acclaim, and rightly so. It's a very simple, functional design. Encased in a durable metal housing with barrel footswitch, the Pitchblack measures in at just slightly smaller in dimension than the more famous Boss TU-2/3 tuner. This is a plus for those with cramped pedalboards.The Pitchblack also sports true bypass switching, so it won't color your tone when placed in your signal chain, and if you operate it via battery, you won't lose your signal in bypass mode if the battery suddenly dies. It boasts 4 different display modes, including: Meter, Full Strobe, Half Strobe, and Mirror. The display itself is large with a readout of the note along with a range of LED lights that display variances in cent by their brightness in standard meter mode. The tuner also has a parallel power jack for jumpering other 9v pedals from the same power source. The cons of this otherwise great pedal tuner are note tracking time, and display brightness. On a dark stage, it's easily seen, but outdoor daytime gigs are the enemy, and direct sunlight can render the Pitchblack almost impossible to read. I found this was sometimes subverted by tucking the tuner or the pedalboard on which it sat, as close to a monitor wedge or other source of shade, as I could. The Pitchblack exhibits some lag to how quickly it tracks a note compared to other pedal tuners, most notable the Boss TU series. This isn't a good thing when your singer doesn't give you much time in between songs to tune your guitar. 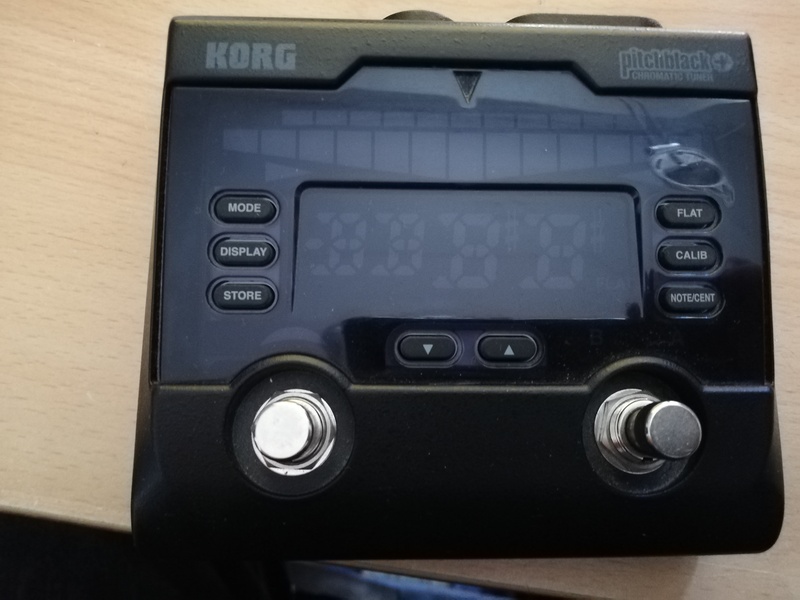 What this tuner has going for it is accuracy and simplicity, and this was enough a few years ago, but with the introduction of competitively priced models from other manufacturers that are comparable in accuracy, Korg would do well to update the Pitchblack with a brighter display and faster note tracking. If they can do this, and maintain the original price point, I don't see why the Pitchblack series can't compete with the new and improved Boss TU-3 to become the gold standard in pedalboard tuners. •	The Korg Pitchblack is the best pedal tuner I’ve ever owned. 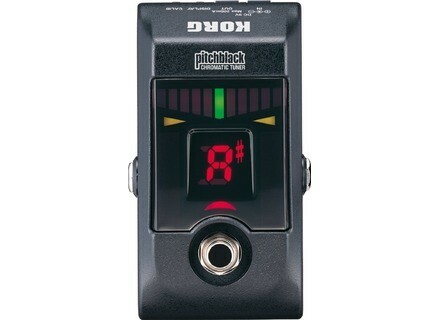 I’ve went through the Johnson Chromatic floor tuner, the Boss TU-2 and now I’m sticking with the Pitchblack by Korg. The Pitchblack not only looks sleek, but it also takes up a little less space on my board than the other two did. The reason I prefer this tuner is simple; it just works better. The tuner quickly picks up the signal from my guitar and the LED’s smoothly light up letting me know when I’m close to true pitch. The note you are closest to shows up in a large and easy to ready note name display. The pedal is much easier to read in the light than any other tuner I’ve used which comes in handy when playing outdoor festivals. The Pitchblack is built very well and has been used for several gigs without a hiccup. The housing of the pedal is made out of a die-cast aluminum and the jacks and bypass switch are top notch, so reliability should not be an issue. The screen has an eleven segment LED meter which makes accurate reading a breeze. It has a tuning range of E0 (20.60 Hz) to C8 (4,186 Hz) and an adjustable calibration that goes from 436Hz to 445Hz. The pitchblack's LED meter can be switched among 4 display modes including: Meter, Full Strobe, Half Strobe, and Mirror. Meter mode is just like a needle meter, if the light is to the right of the center the note is sharp and to the left of the center it is flat. When the green light in the center is lit you are in tune. Full strobe mode will have the LEDs streaming to the right if the instrument is sharp, and to the left if the instrument is flat. The streaming will stop and both tuning guide LED lights with be on when you are in tune. Half strobe mode is a mix between the last two modes. The LEDs will stream similar to full strobe mode, but the center green LED will light up when the instrument is in tune. Mirror mode lets you meet the LED’s from the left and the right into the center spot when the instrument is in tune and the green light will be lit. This pedal has 100% true bypass so tone robbing is not a problem. I do not notice it in my signal path at all. The pedal also has a silent tune feature that lets you tune without the crowd having to listen to you search for the right pitch. A 9V DC output jack lets you power other pedals off the power going into the tuner. Tuning is very important and this pedal is worth every penny. Quality isn’t cheap, but with this tuner it’s reasonable. A reliable tuner is a lifelong investment. Overall this is a very sturdy and reliable tuner that is easy to read in all settings and works great without hogging a lot of floorspace. If I had to go out and buy a new tuner today the Korg Pitchblack would be my choice time and time again. Korg's Pitchblack is a chromatic tuner pedal, designed primarily for use on the stage. It has LED meters so you can see the pedal in, you guessed it, pitch black. It also has four modes to choose from and is about the average size of a guitar pedal. The LED meters are definitely brighter and larger than most other chromatic tuner pedals that I've seen out there, which is great for shows. 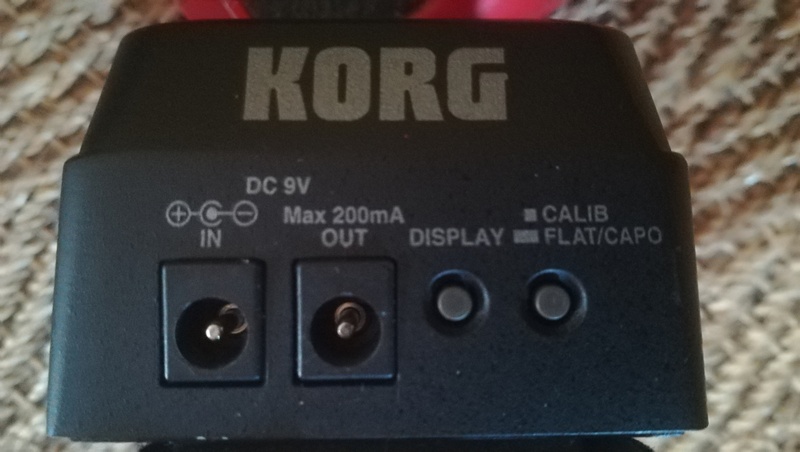 It's got a standard make up with 1/4" connections for input and output and power can be achieved by plugging a 9 volt power supply into the jack in the back. You can also change the calibration and display with controls on the back of the pedal. Like the Boss TU-2 and TU-3 chromatic tuners, it also has a power supply output for connecting a daisy chain and powering up other pedals, although I'm not sure what the full range of compatibility is there. There aren't any other technical characteristics to worry about, and I think that users will be able to catch on very quickly when it comes to tuning your guitar or bass with this pedal. The price is a bit cheaper than the Boss chromatic tuners, but isn't that much cheaper when you consider that this seems to be a bit less sturdy than it's competition. It should still last for a while, but I don't own one and can't say for sure. 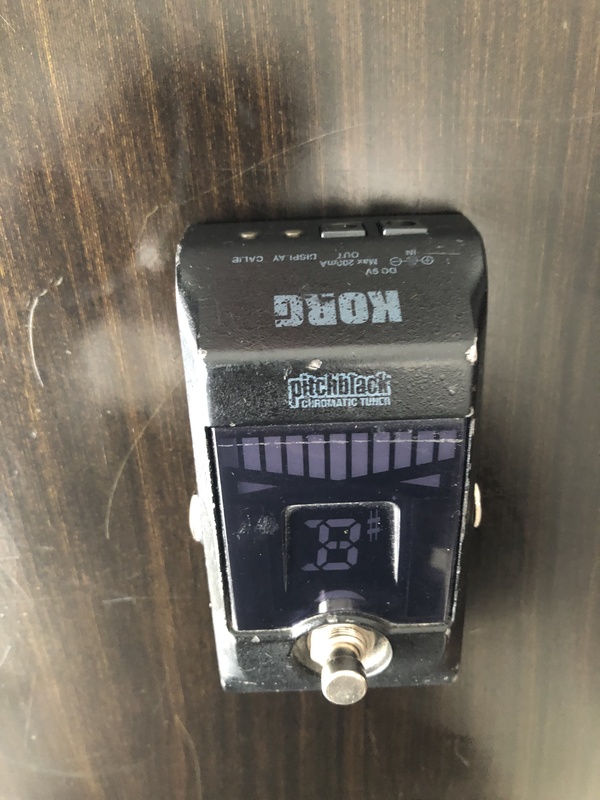 I do own the Boss TU-2 and it has served me well for years without problems, so it's definitely worth considering that if you're looking at the Pitchblack for a chromatic tuner. Pitchblack is a nice design but it's not groundbreaking. I do like that it's super simple and gives you only the basics, but it does seem like it could be a bit better built in terms of it's casing. Either way, it's worth checking out if you're looking for a reasonably priced tuner for your live show. 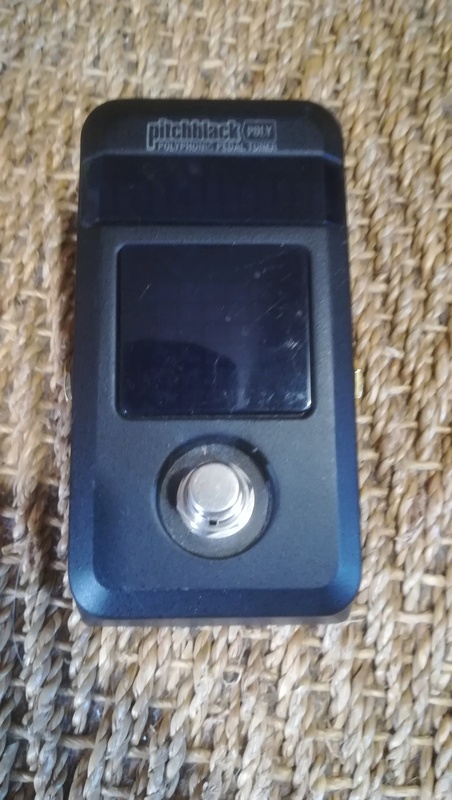 ejendres's review"One of the best tuners out there"
This is hands down the best tuner I've owned. It extremely well built; I've been gigging mine for years and had no issues. The display is really bright so it is easy to see in dark clubs. During outdoor gigs there are no issues either, even in bright light the display is easy to read. The face that its easy to see in any light comes in really handy. It is also a little cheaper and much better than the BOSS equivalent. You can't go wrong. I've been using this tuner exclusively for the past 3 years or so. I've used it extensively for gigging like I mentioned before, but I've also used it to setup my guitars. It is accurate to +/-.1%, which is perfect for setting the intonation on a guitar. 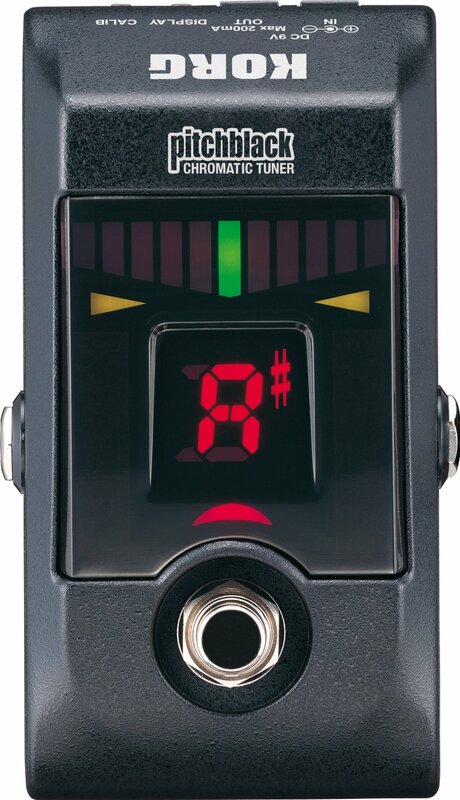 Since the tuner is chromatic you can use it to setup a guitar in any tuning. It is really handy. I also really like the simplicity of it. There are not any unneeded bells and whistles, it does one thing and it does it extremely well. It will accurately tune your guitar. Before buying the Pitchblack I owned a BOSS tuner, I've also used a bunch of built in tuners in multifx units. The Korg tracks much faster than any of these other tuners. It also seems better built than most of them. Another great feature of the Pitchblack is the true bypass feature makes the tuner completely transparent. The TU2 used to really color my tone when bypassed, along with all the other tuning units I’ve used. It is not something that happens with the Pitchblack. I realize this review pretty much sounds like a sales pitch, but I honestly can't find anything wrong with this tuner. Its fast, accurate, and cheap. Whats not to love? Korg USA has announced a new fall rebate promotion on some of their models.